I met Rosanna a month after Typhoon Haiyan. She lived in Santa Fe, a small and impoverished town with one of the highest malnutrition rates in the entire Philippines. She had a baby bump and thin arms. Her mid upper arm circumference was just 19 centimeters, a leading indicator of malnutrition. Pregnant and lactating women should measure above 21 centimeters. She was unkempt with a wild look in her eyes. 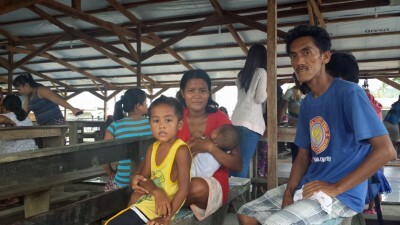 The toll of Haiyan and the life of poverty it brought had ravaged her mind and body. 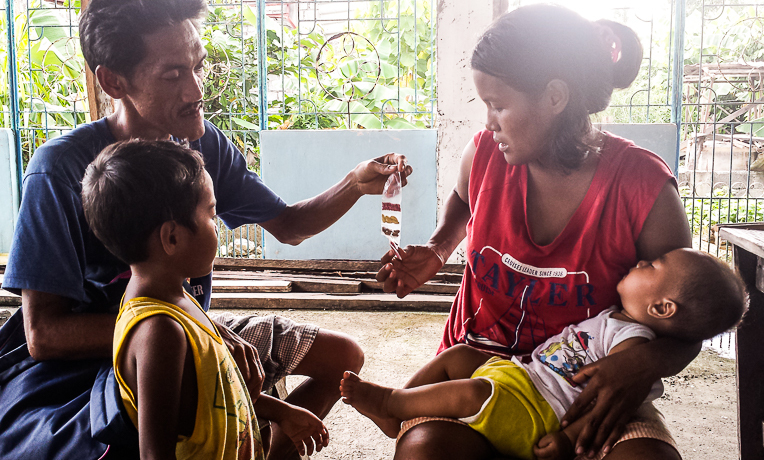 For five months after we met, she would religiously trudge 30 minutes to our feeding program site in San Isidro with her 4-year-old son for her ration of supplemental food. The ration tastes like peanut butter and is used to supplement the needed micronutrients a mother’s body needs. For five months, we slowly tried to coax her out of her shell. She was shy and would only answer our questions with a few words. When Gerardale saw Rosanna earlier this year, she didn’t even recognize her because she was at a healthy weight. Last May, while visiting the town’s Rural Health Unit, my eyes saw a familiar face breastfeeding in the dark corner of the room. I couldn’t remember where I had met her or who she was, but I invited her to join the one-on-one Infant and Young Child Feeding counseling we were having. I asked her if she knew where I had met her. “Ma’am Ge-Ann, it’s me, Rosanna, your patient from San Isidro,” she said. My eyes began to water. I could see the similarity, but the Rosanna I once knew was emaciated. This Roseanna was healthy. The Rosanna I once knew was shy and weary; this one was bubbly and happy. A lot had changed. Because she was moderately malnourished during her pregnancy, I was expecting her to have a low birthweight baby, but the child she was cradling in her arms was a healthy boy. I told her how happy I was to see her again. I had continued to pray for her and her baby’s health. And God was good. She was larger and fuller now, and her boy was healthy. I asked her to join our class at San Isidro. Four months later, I was doing supportive supervision again. Heavy rain started pouring, and the raindrops splattered on the tin roof. In walked a drenched Rosanna, her husband, and her two children. She waved her hand upon seeing me. Rosanna’s husband attends the classes with her and supports her in the things she is learning. She said her husband suffered from kidney pain and difficulty when urinating but would trudge on with her for more than a mile every Thursday just to attend our class. Her husband used to be a vegetable farmer but since Haiyan, he doesn’t have the capital or the strength to farm again. As I was measuring her left arm, she told me how she has been attending the class for quite a long time now. In fact, her husband would often correct her at home when she didn’t position her child correctly during breastfeeding. As she was telling me her story, I stared at the measuring tape wound around her arm. It said 25 centimeters. She is a testament that with regular rations paired with proper counseling, a behavior change can happen. I praised her for eating healthy and gave her a packet of seeds. I saw the excitement light up in their eyes as they identified the seeds and quietly planned for a small vegetable garden in their yard. Rosanna is an example of one of the joys I’m excited to experience every day in my work. Through our program, we are creating a behavior change in a whole new generation. “The Lord is good to all, And His tender mercies are over all His works” (Psalm 145:9, NKJV).